Kim here today with a twist on our WHERE YOU CREATE feature. It’s time to get organized on the move! Let’s go to a retreat! I tried desperately to post this feature last weekend while at a retreat; but alas I failed! The wifi at our retreat was at best unreliable and well honestly, my brain was squirrelling every minute into conversations and laughs with the wonderful group of people I was spending my time with! Trust me…there are way worse evils in the world than what was my dilemma! So today, we will have a big photo share. A share of how “my peeps” pack and lug all of their scrapbooking supplies to a retreat. THIS is real life! Some are very organized, some are very random and some…well, bring everything but the kitchen sink! I “hang” with some incredibly talented people, so I figure if it works for them…it just might work for you too! Baskets are a perfect way to tote paper and embellishments and of course the most recent issue of the BEST scrapbooking magazine we know! As a group we never lack for the BIG ticket items to join our fun! Die cutting machines, computers, sewing machines and printers can be found near the available outlets! We are all familiar with the 12×12 plastic storage bins. These have been a travelling storage saviour for years! Portable file folder bins found at your local office supply store can make a wonderful organizer on the go! Thirty One Gifts has a variety of fabric totes and storage ideas…these were a favourite amongst our group! Cardinal retreat rule number one: never forget your paper cutter! BY THE WAY…this particular desk did not look so neat by the second day! You can tell we have just begun, our tables are organized and not everyone has arrived. A glass of wine helps to unwind after a busy work day and travel! Some creative desks are so fun to hang out at! I swoon over the pen and ink storage! It’s so important to have adorable storage that makes you smile! I seriously wanted to walk away with this brush holder…but I adore the owner! 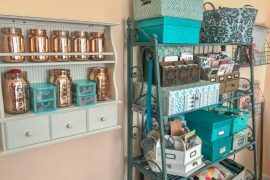 Don’t overlook your hardware store for storage ideas! Tool boxes are handy for lots of things and so easy to carry! Too much to carry on your own…trolleys come in lots of easy to use sizes! This was a super fun storage idea I had never seen! Modular units attach to your desk for easy access, but keep your desk clear! SMART! Wine and ink storage! This ink storage is perfect for on the go, it was an old ledger drawer from years gone by! makeup bags are a GREAT option for storing pens and brushes and small items to go! There are great desk storage ideas that have been around for awhile. These totes are found on many desks…at home and away! No retreat is complete without snacks! This is but a SMALL peek at our treats. One of our besties brought a crock pot full of “Egg Rolls in a bowl” for our first night! Retreats are a wonderful way to break from the stresses of daily to-dos. I personally find a weekend away with people near and dear to my heart energizes me. We laugh until our faces hurt and sometimes we cry because our friends are hurting. We need this release in a safe place, with people we love. I drove home from this retreat smiling as I thought of our silly shenanigans. I’m certain I have banked enough happy to last while…and if not, these friends are a text, email or call away! They are my life coaches! In closing…grab some friends and book a retreat! Be sure to take a copy of Creative Scrapbooker Magazine‘s winter issue, you may want to “scrap-lift” some ideas if your brain squirrels like mine! Hi Kim, what a great article. I just went to my first crop and I just loved every minute. Three days of fun, frolic and no commitments. I was amazed by the amount of “stuff” the ladies hauled to their three day getaway!! But once I was there for a day I realized why all that “stuff” is necessary 🙂 I guess the thing I noticed most was the welcoming atmosphere of the event and the open acceptance the ladies exuded to a fellow scrapbooker. You could certainly feel the love and new friendships were made. I can’t wait to a attend another crop retreat. Great ideas! I don’t want to be the gal who brings everything from my basement scrap area – but I always am! Thanks for the “travel tips”! I agree, wine and treats while scrapbooking go well together. I love everything about this post! I am amazed by the amount of stuff some of your friends brought! I realize each and every item is important, but when you showed the Raskog, I was thinking, “my word! They packed furniture!” I would love to know more about the tealish colored caddy that was attached to the table. I could see it is made by Tonic. I am on a mission! Thank you so much for sharing so many pictures. They really do help tell this story!